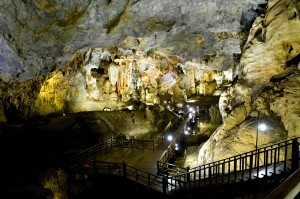 Paradise Cave located in the ecological area of Phong Nha – Ke Bang heritage; Vietnam is the longest dry cave in the world. Its length is 31 km and the widest spot is about 150 meters. Initially 5 km of the cave was discovered in 2005 by British Royal Cave Association, but after five years of mining, paving the way, building the up-and-down way, Paradise Cave is opened by Truong Thinh Group in September 2011. Comments for The longest dry cave are now closed.